It's stunning how George Olsen, managing principal of the New York City Regional Center (NYCRC), could profess to be shocked, shocked that the firm's affiliates in Asia are deceptively marketing green cards in exchange for investments in Atlantic Yards. At a recent seminar in Seoul, an agent for the Kookmin Migration Consulting Co., working on behalf of the New York City Regional Center, told would-be investors if they invested in the company's latest project their permanent green cards were "guaranteed." He also implied the investors would be financing the construction of the new home for the New Jersey Nets NBA basketball team. In a subsequent interview with Reuters, George Olsen, managing principal of the New York City Regional Center acknowledged the claims were "not accurate" - the investors will finance the rebuilding of a rail yard and some related infrastructure near the new basketball court -- and promised he would jump on Kookmin "with two feet." "But that's what's frustrating," Olsen said. "You can't be at every seminar, you can't be at every meeting, you can't be in the room when one of these people is talking. To raise $100 million, you have to get 200 investors. That's a lot of people. So there's a certain amount of mass marketing that has to go on. Nah. As I pointed out December 23, those same claims were made by Olsen's own point man in China, Gregg D. Hayden. And those same claims were made in the official project video as presented to investors in China, the audio of which I reproduce below, with annotations. Notably, in the video, several public officials endorse the "project," but they're talking about the larger Atlantic Yards project, not the smaller project in front of investors. Paul Levinsohn, one of the NYCRC's two Managing Principals, has a bit of a history as an operator, exploiting a legal loophole to get rich, as one of New Jersey's "Billboard Boys." Levinsohn leads off the video for the Brooklyn Arena project, above, just as he does this NYCRC introductory video, embedded directly below. The New York City Regional Center is pleased to offer EB-5 investors another secure, job-creating project in conjunction with the government of both the state of New York and the city of New York. The $1.4 billion Brooklyn Arena and Infrastructure Project is one of the most important development initiatives under way in the city today, and one of the city's largest investments in job creation in the last 20 years. Note how he uses the term in conjunction with, leaving the implication that the city and state are partners, even though they're not. More importantly, at 0:55, Levinsohn quickly elides the difference between the $1.4 billion Brooklyn Arena and Infrastructure Project and the larger $4.9 billion full Atlantic Yards project, a tactic common to the pitch as a whole. Viewers are told this "once in a generation landmark project" is a "22-acre, 7.8 million square foot project." That's not true. This once in a generation landmark project will transform Downtown Brooklyn and become a center of commerce and culture for all of New York City. Located at Atlantic Yards, the 22-acre, 7.8 million square foot project includes the construction of the Barclays Center, a new 18,000-seat sports and entertainment arena, a new modern trainyard at one of New York City's busiest transportation hubs, and vital infrastructure work necessary to open the arena and build thousands of new apartment units in the future. The Brooklyn Arena and Infrastructure project is a vision of the government of the state of New York and the city of New York, as well as Forest City Enterprises, one of the the largest real estate firms in the United States, a publicly traded company on the New York Stock Exchange. Continuing to conflate the proffered "project" with the overall project, he suggests that the state and the city envisioned something they called the Brooklyn Arena and Infrastructure Project. They did not. This project is one of the great job creators currently in New York City. There are thousands and thousands of jobs created by this project. The city, state, and various federal officials strongly support this project. The economic development opportunities here are undeniable. This project will yield 1.5 billion dollars in economic development for the state over the next 30 years and will have job creation the likes of which Brooklyn has never seen. Paterson's numbers were way off base, but he was speaking about the larger Atlantic Yards project, not the yet-to-be unveiled Brooklyn Arena and Infrastructure Project. We need these kinds of major investments more than ever before and, by all accounts, the Atlantic Yards is the largest private investment and job creator in Brooklyn history. Atlantic Yards is the largest development in decades in Brooklyn, USA and one of the largest in the entire city of New York. I want to say how excited how we are that, in two years, the Brooklyn Nets development will be completed and offer a new opportunity and a new way in life in our borough. The cost of the Brooklyn Arena and Infrastructure project is 1.4 billion dollars. The 249 million of EB-5 funding represents only 17% of the total project costs. The balance of the funding comes from the following government and private capital contributions. 100 million from the government of the state of New York, 131 million from the government of the city of New York, 511 million of proceeds from New York State-sponsored municipal bonds, and 457 million from Forest City Enterprises. At least in this case, the NYCRC, unlike Hayden in China, does not claim that it is the safest, most secure part of that investment total. The project is structured to provide safety and security for the EB-5 investor, unlike any other regional center offering in the marketplace. The differences are simple, yet significant. DIfference number 1, job creation. The project will generate 7696 jobs, a job surplus of 54% for the EB-5 investor, and 100% of the government and private capital used to calculate the jobs has either already been spent or already placed in a dedicated account ready to fund the project. So the job creation is extremely secure. As I've reported, it stretches the spirit if not the letter of the law to credit immigrant investors credited for jobs based on money already spent, especially when their funding is not needed as seed money or "last mile funding." Difference number 2, government involvement. The project is endorsed by and involves numerous levels of government, including the state of New York and the city of New York. The project is situated on land owned in the state of New York, and there will be 742 million dollars of government-related capital that is funded in conjunction with the EB-5 investment. They have never formally endorsed this project, as opposed to Atlantic Yards, though they're certainly playing along. As I've noted, in conjunction with is among the weasel words and ambiguous language key to the pitch. Difference 3: investor security. The EB-5 investor community will have a first mortgage on land parcels containing over 3 million square feet of development rights, valued at over 542 million dollars. That may be collateral, but no plan has been publicly announced to create revenues that would repay the investors. That casts doubts on the likelihood of getting paid back in full and on time. The Brooklyn Arena and Infrastructure project includes three primary components: the Barclays Center arena, the Long Island Rail Road trainyard, and various infrastructure. The cornerstone of the project is the construction of the Barclays Center, New York City's newest sports and entertainment arena. The Barclays Center is the first new arena built in New York City in over 40 years. The arena will be home to the Brooklyn Nets, a National Basketball Association team. The arena has been built to NBA standards, and will have a seating capacity of over 18,000. In addition to basketball, the arena will host hundreds of events a year: concerts, circuses, and ice shows. The arena is already funded, and Olsen admitted to Reuters that investors wouldn't be funding it. 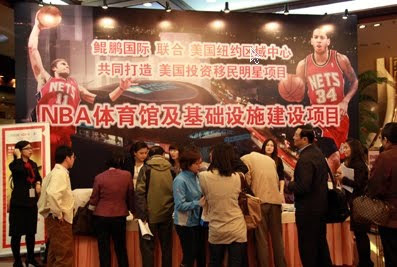 However, if the NYCRC had been straight with investors, it would have had to abandon its entire basketball-centric promotional strategy. The second component is the construction of a new modern trainyard for the Long Island Rail Road. The construction is needed to update services for one of New York City's major transportation hubs. Work on this part of the project has already begun, as the tracks of the railyard have been temporarily relocated to the western end of the project site. Not exactly. While a temporary railyard has been created--not at the western end--the permanent railyard is supposed to start construction by 2012. The new railyard will create additional employee facilities, provide a new signal system, and improve the overall functionality of the trainyard. A platform above the new yard will be built in later phases to serve both as a protective roof for railroad operations and as a base for future developments. The third part of the project involves the completion of various infrastructure work necessary for the construction and operation of the arena, and the construction of thousands of apartment units in the future. The infrastructure work includes the demolition of buildings, the relocation of utilities, the paving of the surface parking lot, and the replacement of the Carlton Avenue Bridge. A significant portion of the work has already begun and is going on right behind me. The Barclays Center arena will be located adjacent to the Atlantic Terminal, one of New York's largest transit stations. Forty million people pass through this hub every year. The project will include construction of a new entrance for the Atlantic Terminal; an underground tunnel extension will be built from the existing station to an area within 100 feet of the arena's main entrance. Above the new entrance will be an outdoor public plaza and a new sidewalk… an innovative landscape. This is work Forest City Ratner is already obligated to do in the most part and is supposed to fund. If the developer wants to substitute lower-cost financing, this may be prudent business, but how can it be considered job creation? We started the project five or six years ago… The railyard work is already under way and three or four months ago, we started on the arena. The arena foundations are partially completed… So it is not only a project which is a vision… but the project has already begun... hundreds of millions of dollars has already been spent. An immense amount of that is our company cash. If FCR has put in a lot of cash, it's also leveraged a lot of government help, both direct subsidies and tax breaks. The EB-5 investment is 249 million dollars. The project will have 498 investors. And since each investor of 500,000 must create ten jobs, the total amount of new jobs needed for 498 investors is 4980 jobs. The Brooklyn Arena and Infrastructure project will generate 7696 new jobs. Therefore, the project creates 2716 excess jobs, for a job surplus of 54%. There are many other EB-5 projects that have speculative job creation. Not this project. Job creation is secure, because 100% of the government and private capital used to calculate the jobs has either already been spent or already placed in dedicated accounts specifically to fund the project. Again, it's questionable why immigrant investors should get credit for jobs based on money already spent. The city of New York, the State of New York and Forest City have already funded a combined 5o1 million dollars into this project, and an additional 698 million dollars in capital is currently in dedicated accounts specifically for project funding. To borrow the EB-5 funds is an affiliate of Forest City Enterprises, one of the largest publicly traded real estate firms in the United States with approximately 11.8 billion dollars in total assets. Founded in 1920, Forest City Enterprises has been a publicly traded company for 50 years and is currently traded on the New York Stock Exchange. Forest City Enterprises' real estate portfolio includes over 34,000 residential units, 47 office projects, 46 retail developments, and five hotels. And Forest City is also part owner of the Nets basketball team. There's no mention of majority Nets owner Mikhail Prokhorov--who is assiduously avoided during the project pitch--or a concrete plan for revenues to repay the loan. Our company is 90 years old. The company is known probably as one if not the largest developer in the country of public private partnerships-- partnerships which involve the government and the private sector. None of that explains how investors would be repaid, however. The largest company in Brooklyn is Forest City and I can assure you that their reputation is unbelievably reliable. They're a great company to work with; they've worked very closely with government. The most important thing: they make a promise, they keep it. Forest City Enterprises has signed a completion guarantee with the state of New York. This agreement with the government obligates Forest City to complete key aspects of the project, such as the Barclays Center arena and new subway entrance. Those would be completed with or without the investors' money. The Brooklyn Arena and Infrastructure project is structured to minimize risk for the EB-5 investor. Each investor will have significant collateral and security for their investment. This security includes a first mortgage on land parcels containing over 3 million square feet of development rights. The state of New York has acknowledged this first mortgage in an official recognition agreement. Forest City will construct seven residential towers and there will be 2400 apartment units, on 3 million square feet of land used as collateral. An official opinion of value report has valued it at over 542 million dollars. The report was conducted by Massey Knakal real estate services, one of New York City's largest real estate services firms. The report has been certified by the Chinese embassy. Actually, if the collateral goes to the investors, Forest City may not be building anything, as a new developer could be found. There are many reasons to question the value. As far as I can tell, "certified" means simply that it's authentic, rather than the content has been verified. In addition, the EB 5 investor is investing in a project that began years before and has seen hundreds of millions of government and private investment. That may be so, but why should immigrant investors get credit for job creation based on that investment? All I can say, Brooklyn is 1000 percent, 1000 percent behind Atlantic Yards, and we invite Chinese investors to join with us, because there's nothing better than China and Brooklyn together. You can hear the immigrant investors chuckling through the subtitles. But do they know that Markowitz is lying? Thank you for taking the time to learn about this landmark project, one of the largest job-creating developments in the history of New York City. We invite everyone to come to New York City and tour the project, and meet the government officials and principals involved. The New York City Regional Center looks forward to answering all your questions and working closely with you and your families to achieve permanent residency in the United States. Again, he implies that government is formally involved in the EB-5 project. He also suggests that the NYCRC can set up meetings with the Empire State Development Corporation (ESDC) to discuss the project. If the ESDC provides such service to would-be investors, perhaps they can invite the public, as well.